Lessons Learned in Puerto Rico, Keep Water Close to Home! Many people in the U.S. think that have it made when they live on a street with curb and gutter. But have you ever thought where that water goes? Often snow melt and rainwater that falls on streets, driveways and yards, simply goes down the drain to the nearest stream, river or lake. Carrying with it fertilizers, soil and other organic materials that damages and pollutes where we want to swim, fish and get our drinking water from! There is a trend toward stopping water from running off, both in the U.S. and in Puerto Rico. However, Puerto Rico is really showing how it can be done cost effectively. Puerto Rico understands that clean ocean water is important to tourism and clean fresh water is vital for its citizens. By eliminating curb and gutter, water that falls on and along roads can simply be left to slowly soak into the ground. 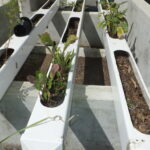 This recharges ground water, provides water for nearby plants, significantly reduces erosion and does not require the constant maintenance of infrastructure to move and dispose of what is really good quality water. In this picture a newly constructed gravel road in Puerto Rico has a “speed bump” that stops water from washing out the road as it comes downhill. The coarse gravel in the road allows rainfall to soak in and the concrete edges hold the gravel in place. Water from up hill and the road goes to small ponds on either side of the road where water can soak in. This road had just been completed and you can see by the color of the water that the pond on the right intercepted a large amount of suspended clay particles that would have otherwise gone into the ocean that is just a short distance away. Many people stress over the soil in their landscape. 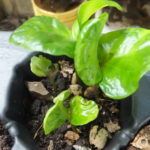 You can use any soil you want and still have great plants. Look around, most plants in natural areas are growing in soils that you would normally think as too wet, too dry, too sandy, too clayey…you get the idea! You can choose plants that fit your soil instead of spending a lot of time and energy altering the soil to fit your plants. Puerto Rico is a good example of this. 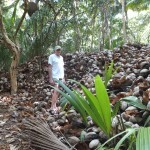 Lots of rock, coral and sandy soils make up the land on this island. But the plants still thrive in these conditions. Poor soils may have better texture, water holding capacity and even more nutrients than perfect garden soils. Do you have rock mulch around your house that has gotten weedy and hard to maintain? You can mulch over with an organic material like shredded bark and put in some permanent plants that fit your landscape. In many cases these gravel beds are too close to the house any way and so you can just leave the stone in place and plant further out too. 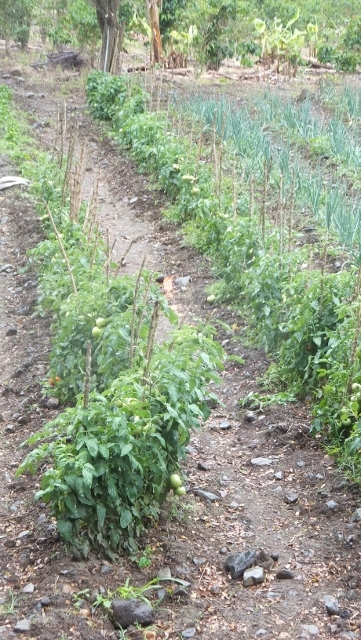 Tomatoes and onions also thrived in the coarse soils. 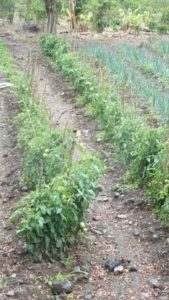 This hillside farm and it’s rocky soil supported a variety of cultivated plants including coffee and citrus. 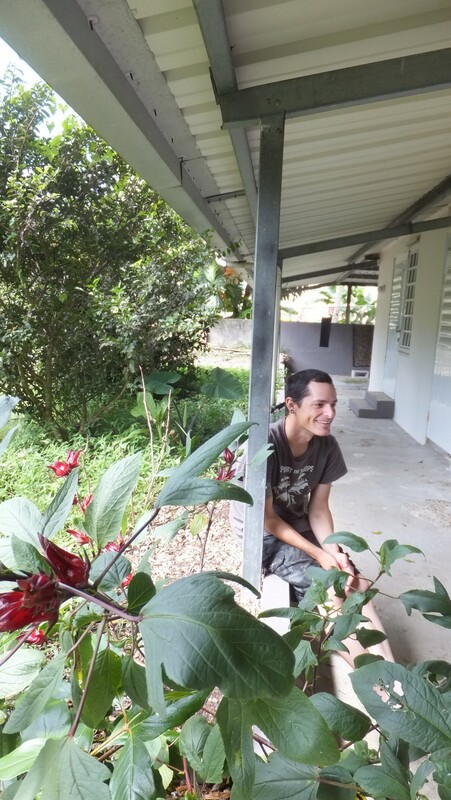 Our Friend Piero is busy growing a variety of plants on his permaculture property. 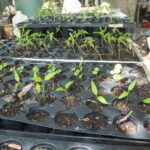 He is also starting plants from seed to insure that he gets totally organic plants. Piero is also trying some different growing methods. 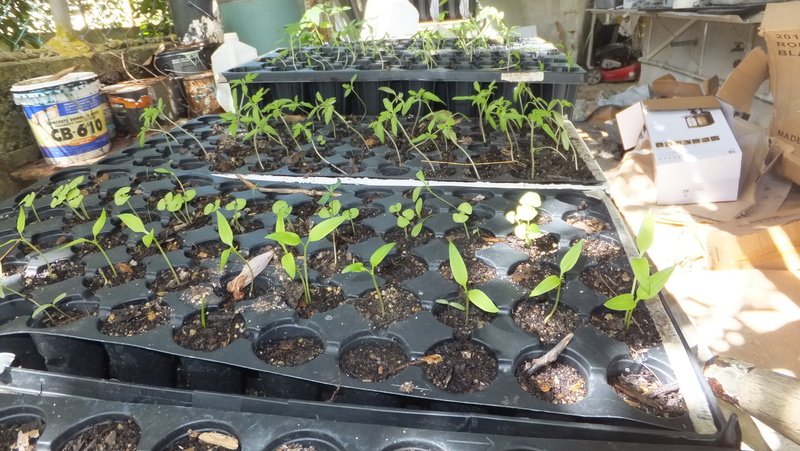 Above a hydroponics projected turned into using real soil, tomatoes starts and coffee plants from seed. 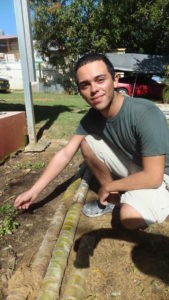 Our host Angel is continuing the family’s interest in growing a variety of fruits and vegetables. 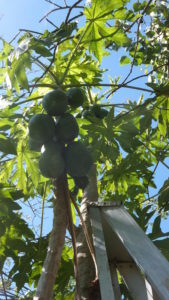 Pictured, he is growing watercress, breadfruit, star fruit and papaya which they shared with us. 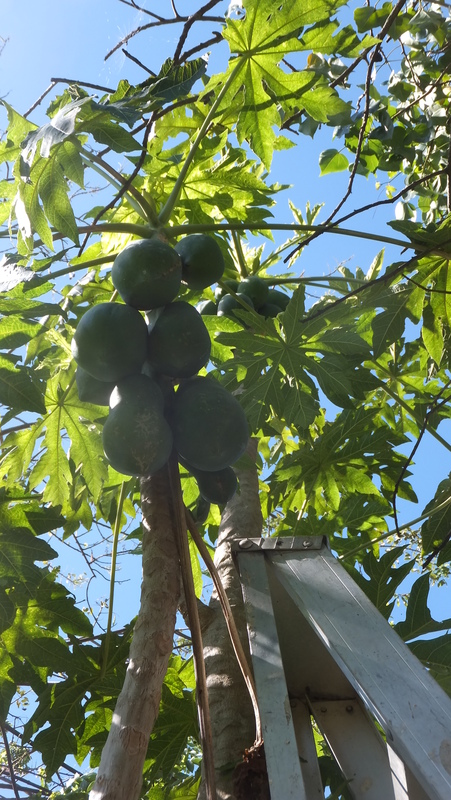 Angel’s girlfriend even climbs trees to harvest the fruit. What a women!! 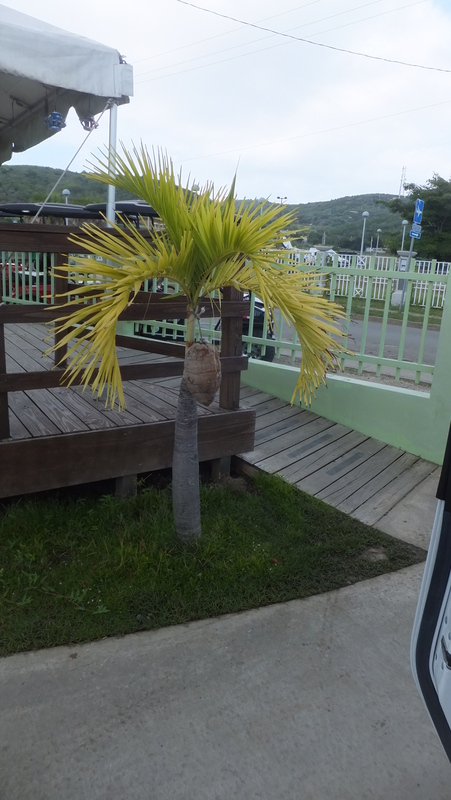 Even the car rental, Jerry’s Jeeps on Culebra, was getting into the act. 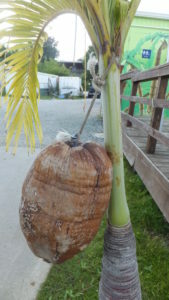 Their philosophy, “if you can’t wait, fake it”, by attaching a coconut to the immature tree! Litter looks bad, but it is the stuff you don’t see that should worry you. Downstream of where the Iron Man participants got out of the water. In Fall 2015 we went down to Louisville to support a friend participating in the Iron Man. Theresa had to swim in the Ohio River as part of the event. It is not the sort of river you want to swim in!!! Whether you live on water or not, all our human activities affect water. Can you name something we do as people that doesn’t impact clean water? I don’t think so! 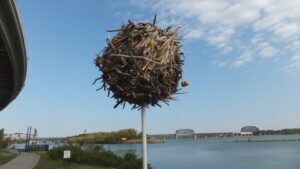 Artists created a sculpture from the river debris near where the photo at left was taken. If you look closely you can see litter woven into the sculpture. Just as how a pond in your yard is built and managed to reduce the opportunity of things to negatively impact it, you can choose to manage your property to minimize damage to lakes, rivers, streams and ground water. Some of the things you should see in water ways and lakes are natural features. Woody materials in lakes and rivers are a positive and natural addition for fish, insects and wildlife. Many species require submerged parts of trees for some part of their life cycle. This stark but thought provoking mural was located west of Quebraillas at Playa de Guajataca where an old sugar cane rail line was cut through the rocks in 1911. You can now walk through the tunnel that connects two beaches. The symbolism of this painting was not lost on me and foreign language skills weren’t needed to interpret the meaning. The tightly wound ribbons of a rigid (military) thinking/mindset are replaced by a steward of the earth with free-flowing ribbons for hands that are open and accepting and going to do the work that is needed. We ran into everyday people, even shuttle and cab drivers, who talked freely about their concerns regarding the environment of Puerto Rico-without prompting them or telling them who I was. While the government is bankrupt, many people expressed that the true value of Puerto Rico was it’s environment. With some of the best beaches in the world that are nearly empty during the winter and truly friendly people where ever you go – Puerto Rico will succeed as it moves forward. There is a lot of work to be done though. 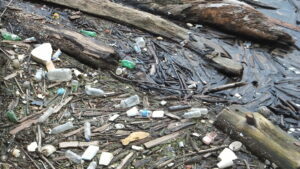 Pollution, littering, poverty and some poor planning regarding pristine resources needs to be addressed. However, those are the same challenges we face at home as we realize the real value of our environment. Lessons From Puerto Rico – What Can You Do in Your Yard? This outdoor equipment in PR, meant to have two people work out together, was one of many to get into shape. What can you do in your yard? Did you resolve to get in better shape this new year? Isn’t it amazing? We drive to the gym, park near the door and work out in air conditioned comfort. Lights, heating, cooling, gasoline and human energy just going to waste! Many studies (and basic, common sense) indicate children and adults need to spend more time outdoors for better health; and more and more people are doing it. 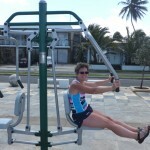 You can set up your own yard to recreate and workout. Even during our winters, most people can and should go outside, have some fun and get some fresh air! 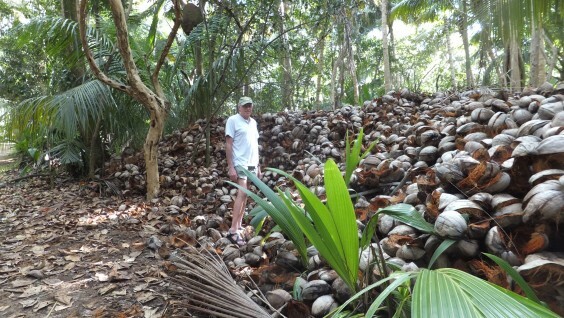 Trees have returned and coconut production is witnessed by this huge pile of husks. 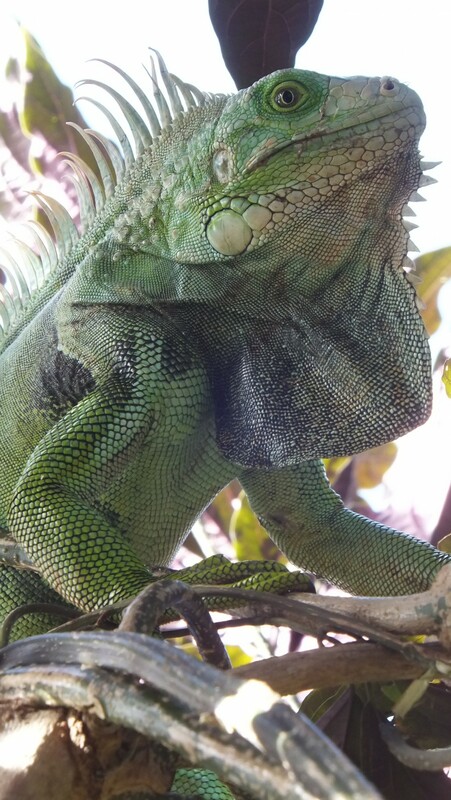 A recent trip to Puerto Rico re-enforced some of the things we are doing right in sustainability and things we need to work on. When friends found out we were headed for Puerto Rico we got questions like; Why go there? What kind of weapons are you taking with you? Aren’t you concerned about crime there? I did check on crime statistics and the murder rate there is similar to the murder rate in Washington D.C. And in Puerto Rico there is an unwritten rule that neither the police or the drug dealers will allow shooting of tourists. 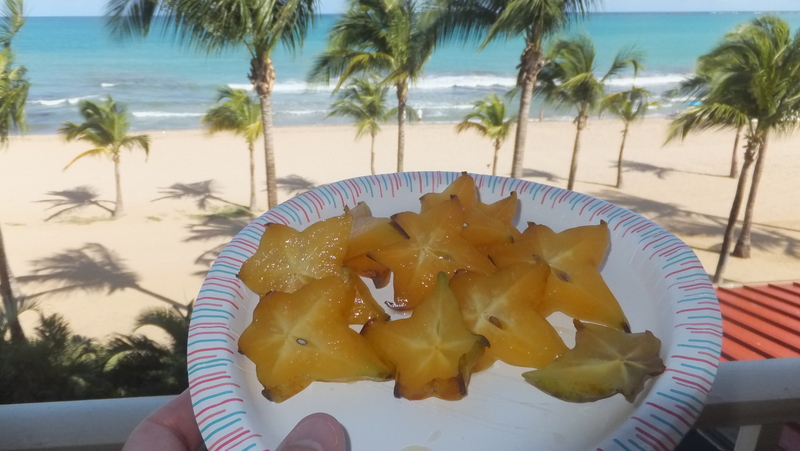 What we found in Puerto Rico were very friendly people, nearly empty miles of beach on week days, lots of local produce and lots of opportunity for outdoor activities. 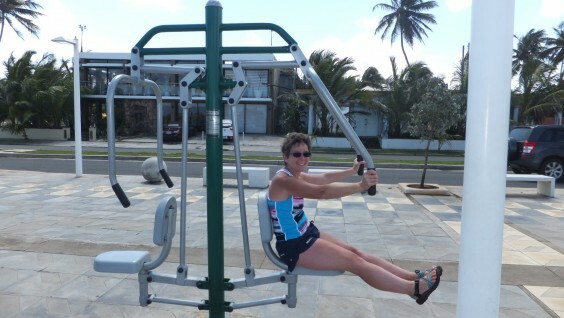 One town had outdoor exercise equipment installed by the ocean front. We also met people who were interested in what we were doing in sustainability in the U.S. and wanted to show us what they were doing! Puerto Rico has had a receding economy for some time. it is losing some of it’s industrial base, people are leaving to find employment elsewhere and many of the downtowns have empty buildings. 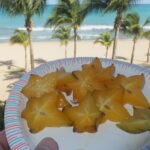 Yet there are many things that make Puerto Rico appear more prosperous than it really is – Kind of like here! The roads are clogged with very nice cars. One of our hosts explained that people skip meals to buy a car because it is a status symbol. There was an over-abundance of fast food outlets and of course everyone had a smart phone. 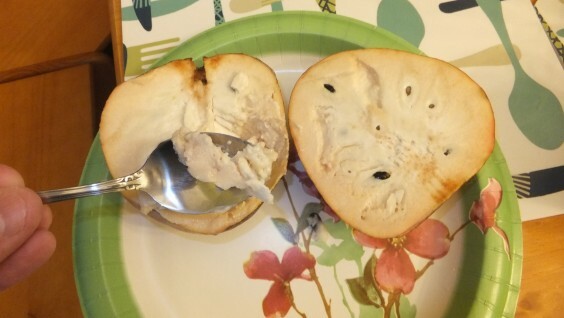 tasted like sweet custard and came from a tree in the yard where we stayed. 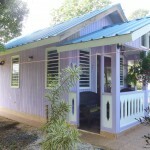 – Small Houses: One of our hosts, Milton,built a small house to rent out to visitors. It was 12 feet by 24 feet that included a small front porch and loft. 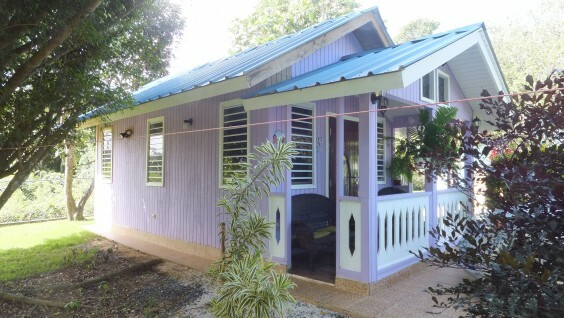 Another host, Piero, converted the family house to small rental apartments for visitors. The contemporary furnishings made the place very modern feeling. Both places came complete with kitchen, bath, bed and furniture. And they were comfortable! Some real thought went into these places. In Piero’s case this allowed him to keep the family home and in both cases allowed the owner to increase the value of their properties. Both of these owners also lived on the property. 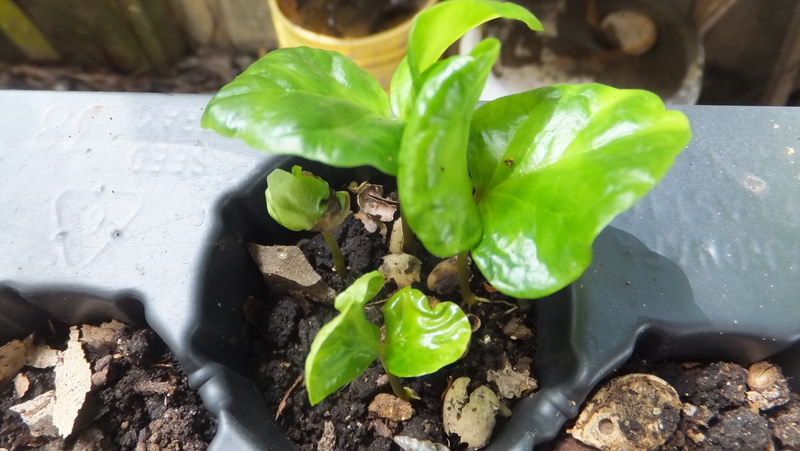 Coffee growing and production is occurring inland in Puerto Rico. 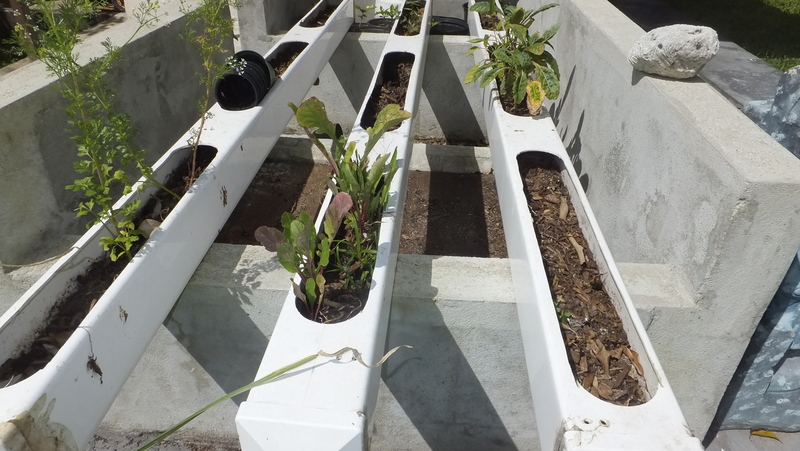 – Growing At Home: Not surprisingly our hosts with small homes also were growing edible or usable plants on their properties too. 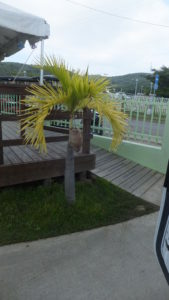 Piero was an easy going personality when it came to his landscape and was doing a little at a time, but had a variety of fruit producing trees including cocoa. 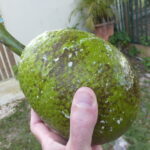 He also had a large ficus tree (only 35 years old!) that shaded our entire apartment negating the need for air conditioning. Oops! I forgot to tell you the electrical rate is double what it is here. Milton had a more perfectionist personality and kept a very neat yard and his fruit trees were carefully placed and orderly. I suggested to him another planting area where he could use the fallen leaves for mulch instead of having to bag them up. Before I left Milton showed me where he was going to install an outdoor shower to reuse water for plants. 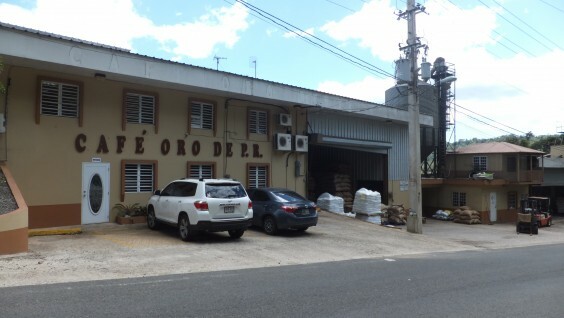 – Small Agriculture: After hundreds of years of damaging commodity agriculture, mostly sugar cane, the forests are reemerging as the dominate land form in Puerto Rico. 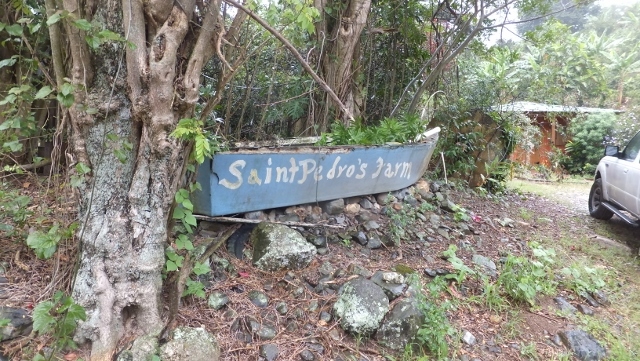 It is hard to image today that almost the whole island was denuded and people impoverished with back breaking work in producing something that had no lasting value. 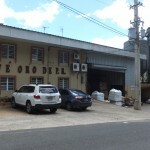 Small fruit and coffee agriculture now dominates. 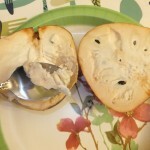 Organic and local agriculture is apparent in local markets and road side stands. Small grass fed dairy cow and beef operations exist and further reinforce that perennial crops-not annual crops-are the sustainable, low maintenance option. Large Iguanas were everywhere. 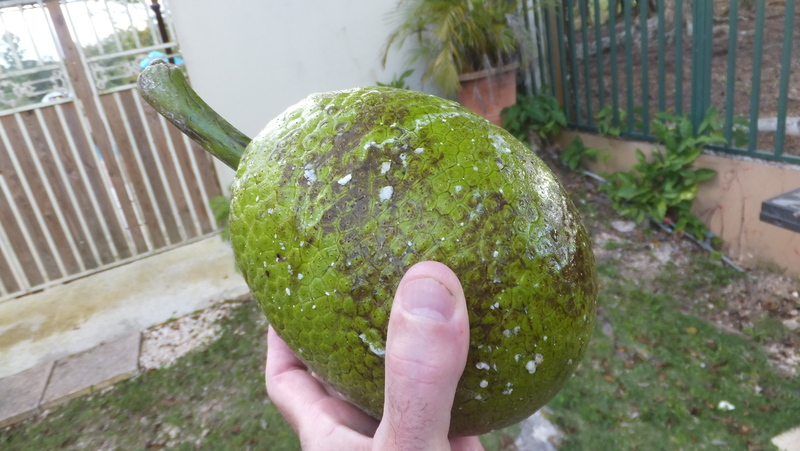 A Puerto Rico company harvests this invasive species and sells the meat! Piero was growing this Roselle for juice as well as other edibles at his “Bright Temple” apartment where we stayed.